This blend addresses achy joints and limbs, which often get worse with cold weather. Impulsion is a modification of an ancient herbal blend to support joint health. These herbs address joint discomfort that often increases with cold weather and subsequently diminishes with warmth. This discomfort may also be accompanied by a sensation of heaviness and numbness in the limbs. 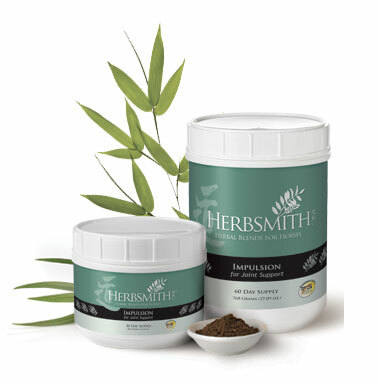 In contrast to Herbsmith Impulsion with Vitality and Herbsmith Impulsion with Composure, this combination of herbs does not affect the whole body by increasing vitality or calming the spirit. This blend is for the balanced horse that is affected by joint discomfort associated with training and daily activity and with the colder winter months. Not for use in pregnant animals. If animal’s condition worsens or does not improve, stop product administration and consult your veterinarian. Federal law prohibits the off-label use of this product in ruminants. An examination from a veterinarian is recommended prior to using this product. Not for use within 48 hours of surgery/anesthesia. One scoop twice daily for the first 20 days. Then administer one scoop daily thereafter. Still Have Questions About Impulsion?